Handystraw Lawn Starter Blanket is available at Farmers Coop in Fayetteville, Arkansas. This starter blanket by ErosionTech helps beautify your lawn by keeping soil and seed in place, aiding and improving germination up to 200%. 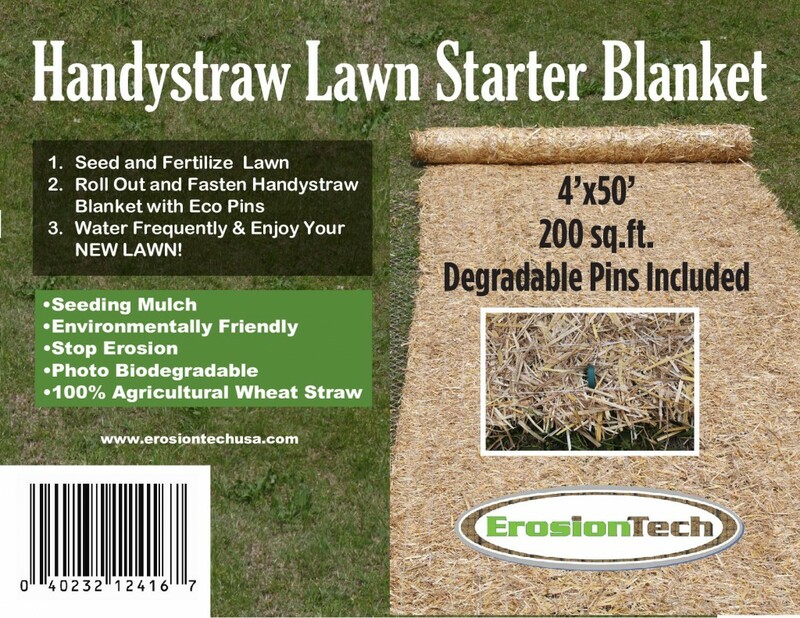 Handystraw Lawn Starter Blanket is the all-in-one biodegradable straw blanket with embedded grass seed and fertilizer that makes it easy to start or repair bare spots in your lawn. Just unroll, fasten in place and water, it’s that simple. Handystraw Lawn Blanket comes in a 4’x50′ roll with 200 sq.ft. total coverage. Degradable eco pins are included. Seed germination blankets such as the Handystraw Lawn Starter Blanket, provides a way to re-seed bare spots in the lawn with an increased chance of success. Germination blankets allow light and water to reach seeds underneath them so they will sprout. Blankets also warm the soil to germinate seeds more quickly. Seeds may be washed away by heavy rains, but seed blankets hold the seeds in place so they do not wash into one spot, sprout in clumps and leave other areas bare. A seed blanket also protects seeds and emerging blades so animals and birds do not eat them. These types of blankets can be used in sparse areas over existing grass to help your lawn fill in evenly. This entry was posted on Thursday, June 2nd, 2016 at 6:53 pm	and is filed under Garden, News & Updates. You can follow any responses to this entry through the RSS 2.0 feed. Both comments and pings are currently closed.